This very versatile product doubles up as a large changing mat or a play mat, as it has anti roll sides to stop your little wriggler getting away. 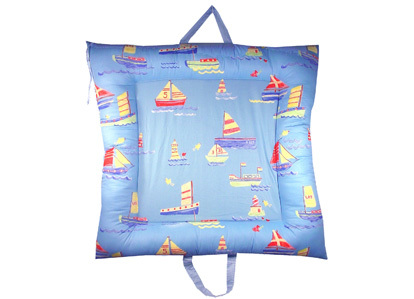 It has a colourful nautical print on one side and a blue gingham check on the other, with 2 big handles to make it easy to carry and a washable cover in case of accidents. It’s a pretty decent size at just over 91cm squared and has been previously featured in Practical Parenting. Available from Nautical Living for Â£39.99.